It’s Throwback Thursday so let’s go back through Upper Deck’s trading card history and come up with a fun giveaway. Free Agency Frenzy is in full swing for the NBA® and big names like Carmelo Anthony seem to be the only topic of conversation in the sports world. Will he stay with the New York Knicks or pursuit other opportunities such as rumored Los Angeles Lakers? Knicks fans anxiously await a decision as they hope Anthony’s move from the Denver Nuggets to the Knicks would be his last. So let’s put up a throwback card and see if our fans can come up with some great captions for the card! 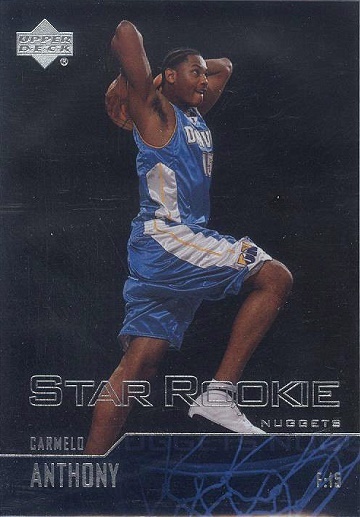 Please share your comical caption to this card for your opportunity to score 5 packs of 2013-14 Fleer Retro Basketball! You have until Friday morning, July 11th at 8:00 a.m. PT to post your caption before this promotion is closed. I feel like MJ at the end of Space Jam! Melo takes flight to throw down an Upper Dunk. Selecting a team in free agency is a 2-step process! I just can’t reach that itchy spot. Flying in to dunk my Car “Mallo Cup” in milk. Taking that first step on the ladder of success. Boy am I glad that Upper Deck put this step here for my right foot! I hope this dunk is as good as Mike’s in Space Jam, except without the Basket. Wait, there’s no basket!?!? Defense… who needs defense when you can dunk the ball? Hopefully Lebron makes his decision by the time this photo shoot is over. I bet I can hit that fly on the wall! This how Michael did it, right?? If I make this shot … Knicks. If I miss this shot … Lakers. I swear….I got deodorant on,…here…SMELL.